Big Apple Bank is a chain of banks in New New York. 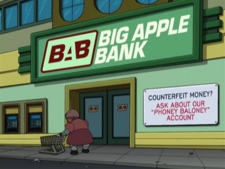 When exactly it was established is difficult to say, but it had to be at least before 2000, because Philip J. Fry had an account of 93 cents in 2000, and by 3000, the account had grown to 4.3 billion dollars. The bank has one known teller and a surveilance camera. Roberto would later hold up one of its branches thrice, which later got him jailed. Its name comes from the nick name for New York City, "The Big Apple". It appears in the opening sequence. This page was last edited on 14 September 2014, at 17:18.